I don't know that I've seen this here, but I found on another forum that some members didn't think to do this! I thought everybody was doing this. So, just in case not everyone here thinks to do this. These GM molded battery cable ends look pretty slick, but if you tighten them too much you strip the threads in the battery. If you don't tighten them enough, well you can have no start problems. When it comes time to jump start your vehicle your jumper cable clamp may slip off. What I do with these GM battery cables with the molded ends, I cut the rubber off with a sharp knife. I then use a 3/8" coarse thread bolt, about an inch long. Thread a nut onto the bolt and then thread the bolt into the battery, finger tight. Now snug the nut up to the battery cable. 1) You are using ALL the threads available in the battery. You are threading into soft lead and if you go too tight with the OEM bolt you will strip the threads in the battery. 2) You CAN tighten the nut down more then you can the OEM bolt, BECAUSE you are NOT turning the threads in the soft lead when you tighten, you are turning the threads on the steel bolt. 3) If you want to add an accessory wire it is easy to just slip under the battery connection. 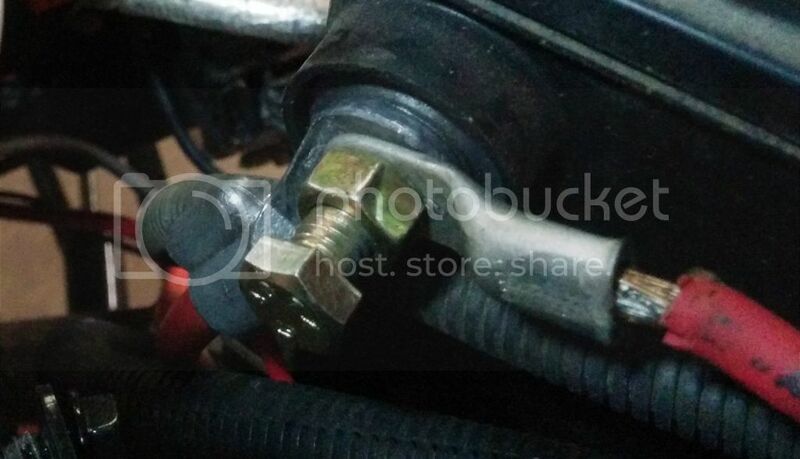 4) If you need to jump start, the jumper cable clamp easily grips the bolt, not that tiny 5/16" bolt head. Your positive battery connection is now exposed and you need to be aware of that. I've been doing this to all my GM vehicles for decades.